The oldest inhabitant of Paris is an American. Kidnapped from the eastern seaboard of North America, and then imprisoned on French soil, the hardy senior citizen has survived revolutions, a World War I bomb, pollution, Nazi invasion . 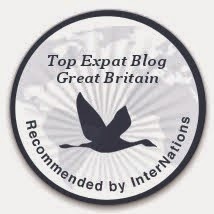 . . and, worst of all, the snobby Parisians themselves. Je plaisante, I tease because I love. 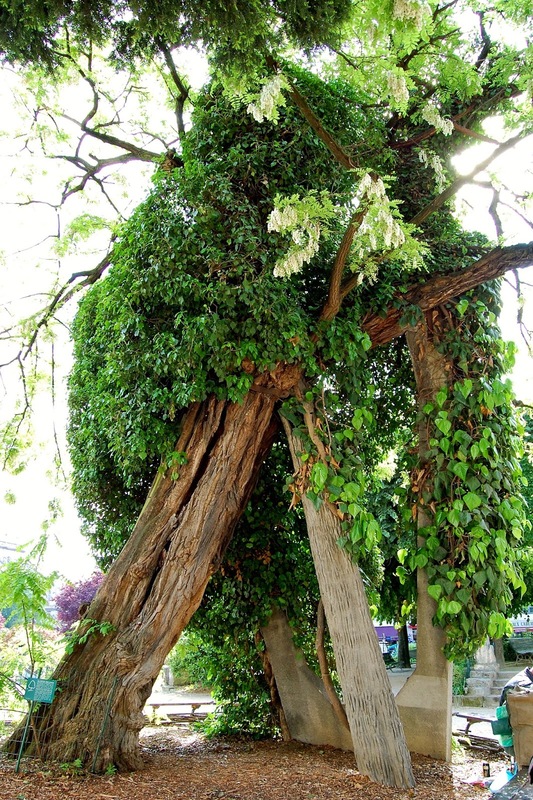 The most elderly tree in Paris, a Robinia pseudoacacia. Its exact date of planting is a matter of dispute. Although a few folks argue the tree was planted in the 1620s or even as late as 1636, most authorities agree the tree was planted in either 1601 or 1602 by the king's botanist, Jean Robin. Appropriately enough, the sign on the tree says 1601, while the placard next to the tree says 1602. Robin prized seeds and seedlings from visitors to the New World. Serving as the king's botanist/arborist/gardener, Robin had previously created France's first botanical garden at the University of Paris's medical school in 1597 and then cataloged the entire Jardin Royal (royal garden) in the last years of the century. He made plantings around Paris in the early 1600s to start beautifying the largely tree-less city. Since Robin is likely the only Frenchman to have had access to both the seeds and the permission to make plantings, he is widely credited as the planter of the tree. Even after 400+ years, the tree flowers every spring. Commonly known as a locust, or sometimes a "black locust" because of its dark bark, the tree is native to the eastern United States. Carl Linnaeus, the famed Swedish botanist and taxonomist, named the tree Robinia pseudoacacia in honor of Robin. As a robust plant that can flourish in poor soil, the locust tree has spread throughout the world. It does well even amidst pollution and hence is often found in cities. 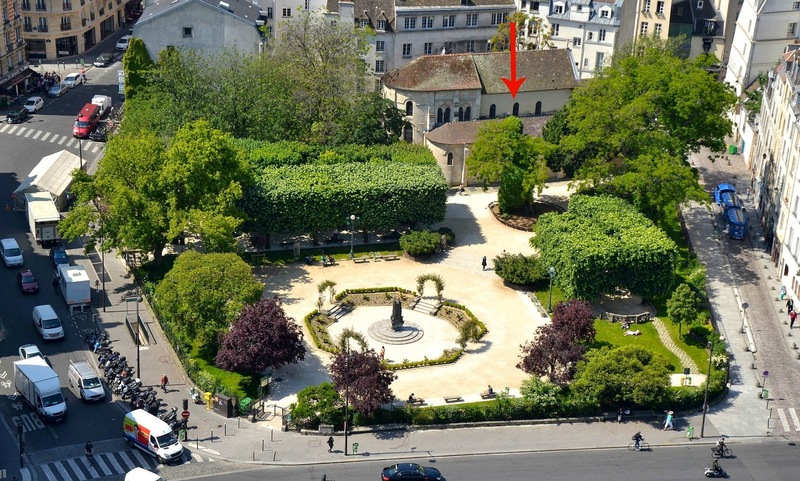 The Parisian tree sits within a small garden square, the Square René Viviani, just across the River Seine from Notre Dame cathedral. 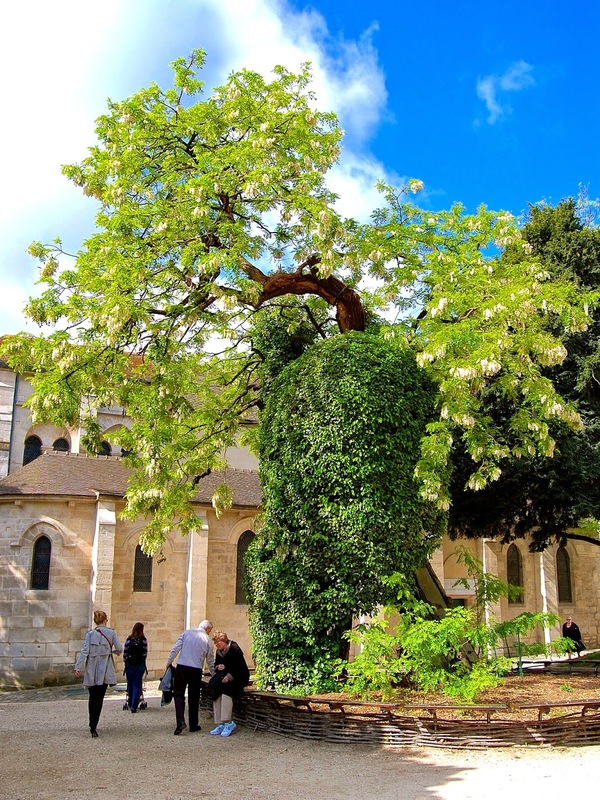 In bygone centuries, the square was occupied by a medieval monastery and then an annexe building of Paris's oldest hospital, so only in the past century has the tree had a clear view to the cathedral. The square was opened to the public in 1928. At present, the tree measures approximately 50 feet tall, which is substantially above average for a locust tree. It would measure higher still, but a shelling during World War I destroyed its upper branches. Despite its great age, the tree blooms and flowers every spring. Truth be told, the tree would long ago have collapsed if not for the concrete pillars supporting its leaning weight. A bit of concrete has even been added to some deep cracks in the tree itself, adding strength to its increasingly brittle bark. From the side facing Notre Dame, the pillars are largely obscured by parasitic ivy, which also would have killed off the tree except for judicious pruning by city gardeners. On the opposite side, however, the pillars are obvious. One of the three concrete pillar supports was fashioned to look a bit like a tree itself. In 2010, the city added hand-woven chestnut branches around the planting, as well as a wooden bench. But other than the small sign at the base (pictured above), which cannot easily be read by the naked eye, nothing indicates the tremendous age and stature of the tree.